Looking for a Star Wars app that will have your Windows Phone growl like a Wookie? Comment on the powers of the dark side of the Force? If so, XDA Developers member bo11ux has developed an app that might fit the bill. 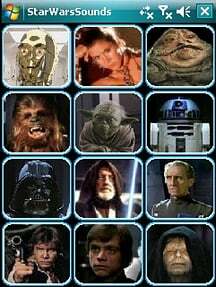 The Star Wars Sounds app is a soundboard highlighting twelve characters from the popular sci-fi movie. Simply tap on the icon for a particular character to hear the sound bite. Each character has three sound bites except for Darth Vadar who has four. Sound quality is a little choppy on some of the phrases but this simple app is a fun addition for the Star Wars fan in all of us. You can download the .cab file here.